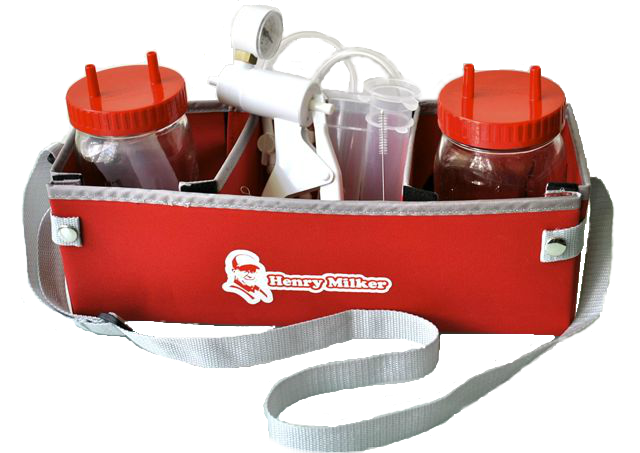 The Henry Milker: Raising Goats in the City? I get lots of mail asking whether people can raise goats in the city limits. You've probably seen the big movement to get cities to allow people to raise chickens in their backyards, and its been pretty successful. 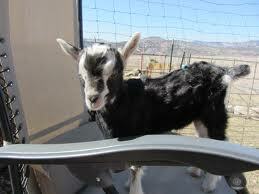 As far as goats are concerned; if you're thinking about having your own little city goats, find out if its allowed. You can check out Municode. It's a great website that lists lots of city ordinances. If you live in a county, outside city limits, you'll have to call your county extension to get details on all the legalities. 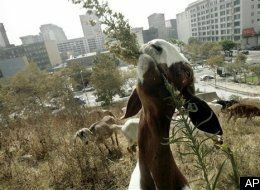 If your city doesn't allow city goats, you can get a campaign going like they did in Denver, Kansas and others. There's a fabulous site that anyone considering raising urban goats should visit! It's called Goat Justice League and it was put together by a fabulous stay-at-home mom, Jennie Grant, who wanted to provide her family with whole foods and the joy of growing up on a farm. She has lots of tips on raising goats in the city and how to legalize goats in the city. 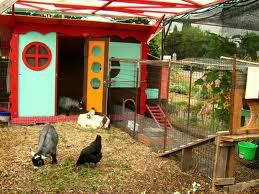 Jennie was responsible for starting the movement in Seattle that helped legalize goats there. Heidi Kooy in San Francisco fights for everything good and is raising goats on the Itty Bitty Farm in the City. Her blog is a must read. Once you've determined you can have goats, there are a few things to consider. Yes, it is the biggest joy in the whole world to witness the birth of baby goats, bring fresh milk to your home twice each day and enjoy the benefits of your EXTREMELY entertaining goat family; but goats ARE livestock so you need to be sure you are READY for your goats before you rush out to buy them! Goats are herd animals and so you must have at least two goats. It's completely stressful for a goat to be alone. 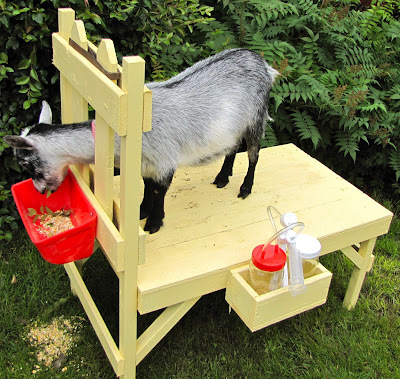 Your lonely goat is liable to eat her way through the fence and into your neighbor's yard creating a playground in their new landscaping, or decide their new porch furniture makes a fantastic rock climbing gym... so be prepared to have two, adorable goats. Goats are going to be a lot of work. You've got to milk them each morning and evening. It doesn't take a lot of time, but you can't miss a milking. 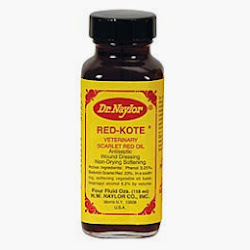 It's painful for your goats and can cause health issues. 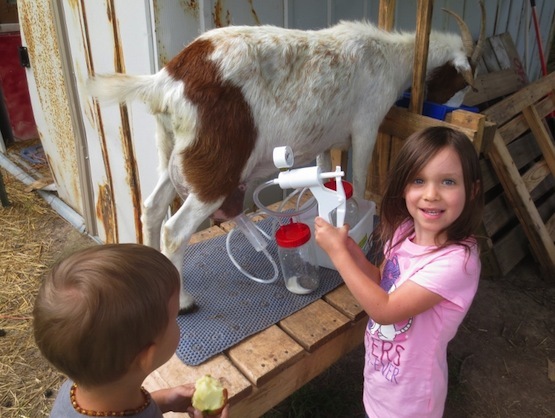 The Henry Milker 2 allows you to milk your goats in no time without electricity and with your goat in perfect comfort, all while you enjoy your morning coffee! 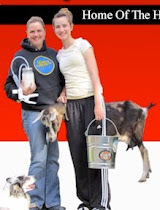 You can make goat cheese, goat soap and all kinds of fabulous goat milk products. But you MUST, I CAN'T STRESS THIS ENOUGH, be committed to milking your goats twice a day at the same time each day. You'll need a milking stand, and they're easy, easy to build! Goats also EAT A LOT! and they'll feast on your bushes and garden if given the chance... so you have to be sure your goats have a "goat-proof" living space so they don't escape to turn your backyard into a smorgasbord. We'll talk about the space in a minute. As far as the food, they'll need bales of hay or alfalfa pellets and high protein grain for your lactating females. We also keep a mineral brick that is made especially for goats that has copper in it (don't get one made for both sheep and goats because sheep cannot have copper so this brick is pretty useless for your goats). 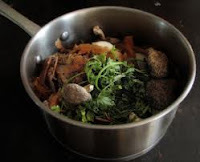 You can also feed your goats veggie scraps and greens--they love that! They also Love BlackBerry bushes and other bush leaves (make sure they are goat compatible before you feed your goats just any bush branches). They won't eat branches, but they eat the leaves. Goats also like to eat out of a feeder that is up high. They do not like to eat anything off of the ground! If you have a feed store nearby, you can get your supplies there and the staff is usually pretty helpful in helping you get started. Depending on where you live it can cost you between $75 and $150 a month to feed your two goats. Don't forget fresh water! 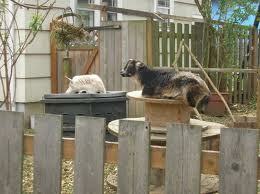 Your goats need fresh water available to them at all times. One of the most important aspects of raising your city goats, is the enclosure. Most cities have codes about how close the goat dwelling can be to yours and your neighbor's house. Find out your city or county requirements. You should keep a miniature breed in the city as they require less space. These breeds need at least a 4 foot tall fence. 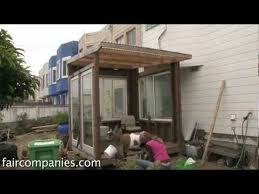 You can use wood, but goats will gnaw on it and you might have to replace pieces every couple of years. Some people use electric fencing, but remember, different cities and counties have different rules about that, so be sure you check. The thing to remember is that your little goat friends are breakout artists... they can squeeze through a gap that's just 4 inches wide! Plus, if you were thinking of using a wire-type fence, your little rascals will reserve time each day to lean on that top part of the fence, squish it, and dent it until they can "make an escape" over the top or under the bottom... they're quite industrious!!! So be sure to build your fence without gaps and with strong, sturdy components (especially lining the top and bottom) or you may find yourself chasing your little darlings down the street in your bathrobe. Keeping it clean is important. You should compost manure in a tumbler and use enzymatic products (available at your feed store or contact your local ag extension) to keep down the smell of urine. Keeping your goat area clean will also control flies and any vermin friends that want to take up residence in your new goat enclosure. Goats also need shelter from the elements! Depending on where you live and the type of temperature and climate extremes, you can use Dog Igloos . 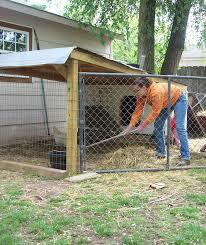 You can also build draft free structures and line with straw or wood shavings for easier clean up. We also have installed a little "covered-porch" area off our enclosure with wood shavings so that our goats have a place to get out of the rain or snow without having to go inside their "house." Goats will also need some routine medical care and maintenance. 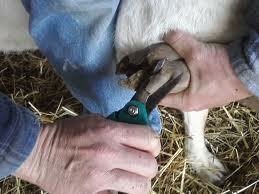 Hooves should be trimmed about every six weeks; deworming twice a year; and a once a year tetanus shot. Proper grooming is a must for a healthy goat. Your goats need to give birth in order to produce milk. We recommend taking your two female goats for a romantic visit to someone who will provide a buck for the occasion. It is important you you learn the "signs" of when your doe is in heat. 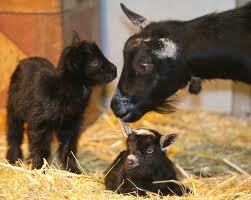 Goats will produce milk after giving birth for about 10 months and then it's time for the process to begin again. 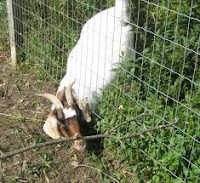 Since your goats need to keep giving birth for milk production, it's a good idea to find out if there are goat farms in the area that would be willing to purchase your new babies once they are weaned. I don't recommend keeping bucks for several reasons. Bucks have a pretty pungent smell (and that's putting it nicely). And bucks need to be dehorned. Bucks can also be ornery and confrontational. Given the limited space in an Urban environment, it's better to just VISIT bucks occasionally than to keep one. We are always happy to answer your specific questions about how to start your urban goat family and would love to hear from anyone who is already having a great time enjoying their goats in the city! Send us your pictures too! Love to share them on the blog! Other Links You Might Be Interested In! I'm sorry I didn't send this sooner, but I've been busy with kidding and having a baby. I couldn't find the original post topic, but it applies here, I think. My Peggy Sue comment was by Axy, don't know why it posted by Unknown.